I had a recipe I was so excited to share with you today, but it will have to wait! I made something else that was so amazing that I just can’t stand it!! I have no patience to wait to share it with you, so I am posting it today. 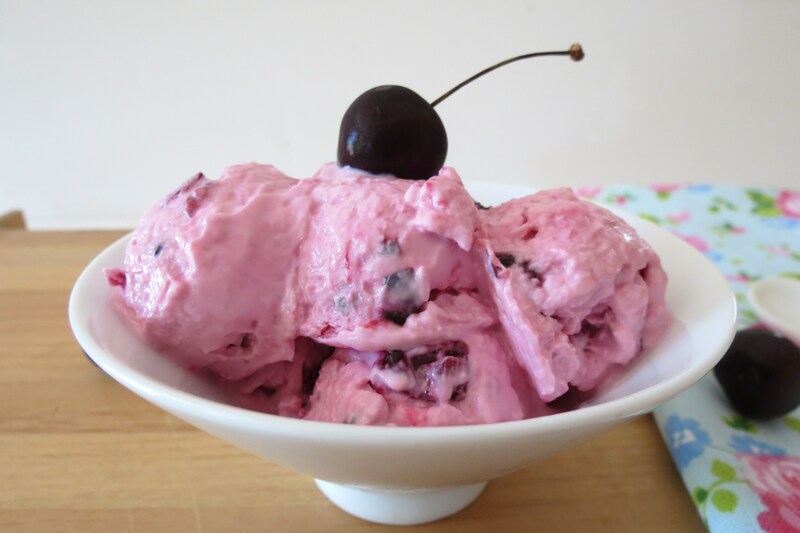 This is my Cherry Chocolate Chip Frozen Yogurt. It is creamy, soft, not hard and tastes out of this world. The best part? No ice cream maker needed! I put this all together in minutes, threw it in the freezer and in about an hour I got this soft and delicious ice cream. Besides it’s creamy goodness, it’s LOW calorie! 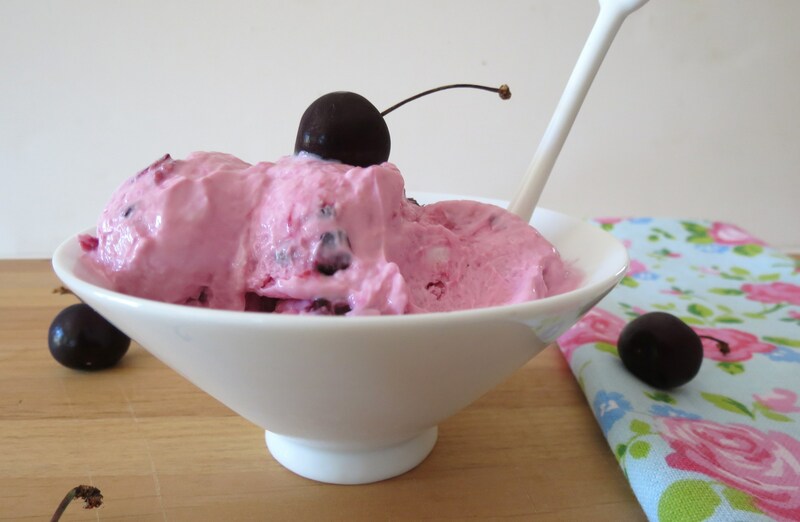 I used 1 cup Chobani plain Greek Yogurt, 5 cherries, 1 tsp. of mini chocolate chips and 3 drops of vanilla stevia. In comparison to frozen yogurt that you get at the store, the serving size is a 1/2 cup, mine is one cup! The protein is 22 grams and the fat is 1.4 grams due to the chocolate chips. I am so happy with this I could just scream! I scream, you scream, we all scream for healthy frozen yogurt! So geeky I know, but I’m so darn excited! Finally an easy frozen yogurt! Whats nice is you can make a one person serving of any flavor you desire. 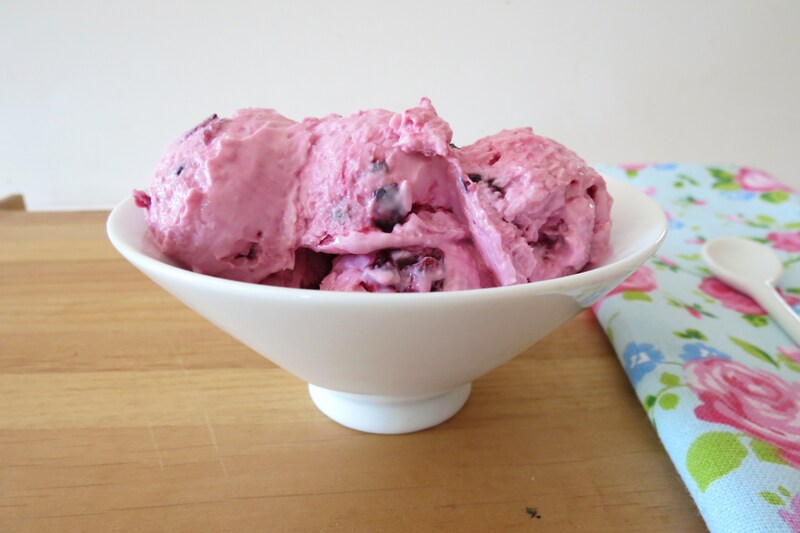 Not like using an ice cream maker where you normally have to make a pint or quart, you can make as much of any kind of frozen yogurt you desire. What I did, when I was getting ready to serve dinner, in a freezer safe container, I added all my ingredients and popped in the freezer, that’s it. By the time I relax and clean-up, my frozen yogurt is ready. I am so loving this!!! Just think of all the flavors you could make? The possibilities are endless!! 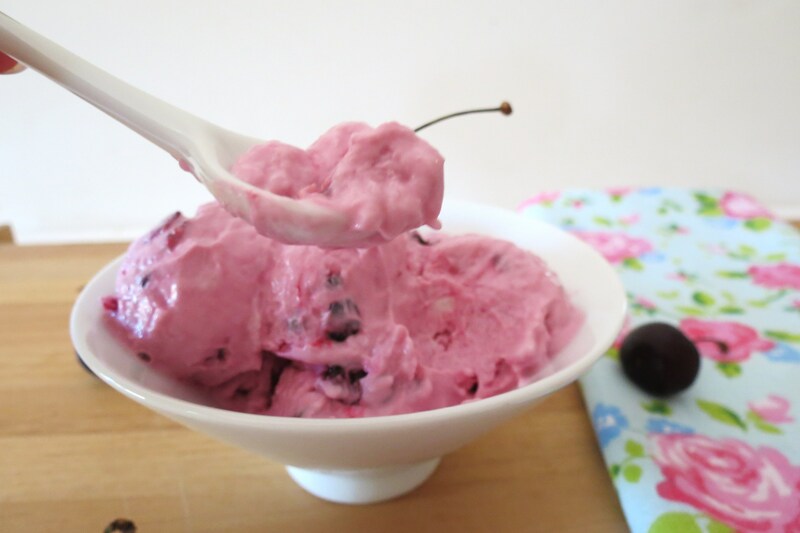 You can even use your favorite flavored frozen yogurt instead of plain!! If I were you, I’d make an investment in yogurt because I”m going to be buying it more then I do now and that’s crazy!! I got the idea from Gina from Running to the Kitchen. She made a wonderful frozen peach yogurt and I used her idea and went from there. You can check out her way of doing it here. 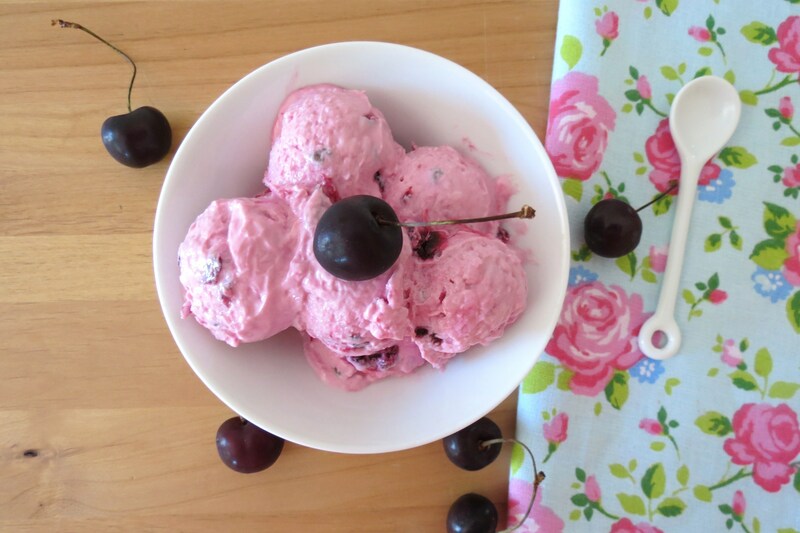 A healthy, creamy, no ice cream maker needed, frozen yogurt made with fresh cherries and chocolate chips. In a shallow freezer safe dish; add yogurt, cherries, chocolate chips and stevia drops. Mix until combined. Remove from freezer and mix with a spoon until all pieces of yogurt are broken up. At that point the ice cream will have softened. Eat and enjoy! If you do not have vanilla liquid Stevia, I would add about ¼ tsp. of vanilla extract or use vanilla greek yogurt and I would add just a pinch of sugar. Taste test it before putting it in the freezer. I hope you like today’s recipe as much as I do. I really wish I could tell you as soon as I make it! I know, I’m crazy and I get so excited over food, but come on, it’s a healthy one cup serving of ice cream!!! You can’t go wrong with that!! I have another one in the freezer right now. So guilt-free that I am having two today. But this one is different then the last one. So be prepared for crazy frozen yogurt recipes in the near future! P.S. I didn’t know Culinary.net was having my recipe for Brussels Sprouts and Bacon on Friday. If you want to check it out you can go here. This looks so yummy! Perfect for the summer! I love how this is healthy and comes together so quickly! Delicious! Thanks Jessica, I couldn’t be more happier with this dessert! Thanks Gina for your fantastic recipes! I just love your blog!! I eat so much greek yogurt I can’t believe I’ve never thought to do anything like this! It really is the perfect summer treat! Crazy how simple somethings can be and then you think dam why didn’t I think of that? So glad I tried this! This looks delicious! Do you think it would work with regular, non-fat yogurt? I have a large container of the Dannon plain, and would love to try it with that. Yes, It will work with regular and non-fat yogurt. Try it, I’m sure you will love it! Remember after an hour of freezing it, mash it with a spoon until all the yogurt pieces are broken up. The yogurt will soften up while mashing. If you feel the yogurt is to soft, just place it back in the freezer for a few minutes. Enjoy!!! Thanks Jennifer! I will try it this weekend! You are so funny! But I’m glad you shared this recipe – it looks amazing, did you make it just to match that pretty towel? how did you get the pink color if you just used plain yogurt? When I mixed the cut up cherries to the yogurt it turned it pink. Ohhh, I’ll check out your pizza! I have been wanting pizza! Yum!! Thank you so much!!! I appreciate it! I love Food Fetish Friday’s!! This looks fabulous – I love the color – so pretty! Thanks Averie! This is my new dessert treat, every night! I love it! 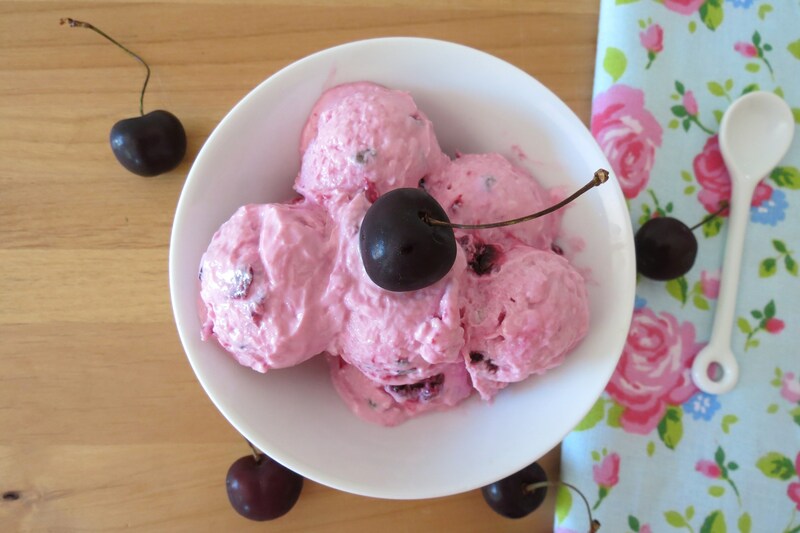 I love the chocolate cherry ice cream and so glad to have found your page and this recipe for cherry chocolate chip frozen yogurt. Can not wait to go to the store in the morning to get the ingredints for this. I will definetly be making this. Let me know what you think of it Marilyn!! 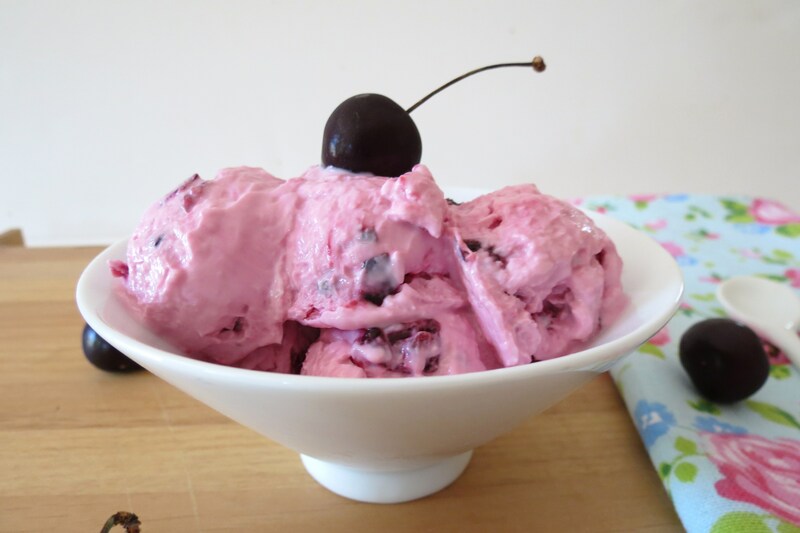 I love cherry and chocolate chip ice cream too! So good!